Review by AllTheBestFights.com: 2019-03-31, pretty good finish between Eduard Folayang and Shinya Aoki 2: it gets three stars. The black belt in wushu and ONE Fc Lw champion Eduard Folayang entered this fight with a professional mma record of 21-6-0 (38% finishing rate) and he is ranked as the No.80 welterweight in the world. He was defeated by Martin Nguyen in 2017 but then he has won over Kharun Atlangeriev, Aziz Pahrudinov and Amir Khan. His opponent, the black belt in Bjj, judo and former One Fc Lw champion Shinya Aoki, has an official record of 42-8-0 (72% finishing rate) and he entered as the No.71 in the same weight class. He lost two consecutive fights between 2016 and 2017, against Eduard Folayang (in their first bout, Aoki vs Folayang) and Ben Askren (Ben Askren vs Shinya Aoki), but then he won three bouts in 2018 defeating Ev Ting in his last one. Folayang vs Aoki 2, main event of ONE FC 93, is valid for the ONE lightweight title (Folayang’s first defense). Watch the video and rate this fight! Review by AllTheBestFights.com: 2019-03-31, disappointing fight between Kevin Belingon and Bibiano Fernandes 3: it gets two stars. The black belt in Wushu and current ONE Bw champion Kevin Belingon entered this fight with a pro mma record of 20-5-0 (55% finishing rate) and he is ranked as the No.17 bantamweight in the world. He was defeated by Bibiano Fernandes in their first fight in 2016 (Fernandes vs Belingon I) but then he has won seven bouts defeating Andrew Leone, Martin Nguyen and taking revenge on Fernandes in 2018 (Bibiano Fernandes vs Kevin Belingon 2). His opponent, the black belt in Bjj, former Dream and ONE FC champion Bibiano Fernandes, has a record of 22-4-0 (45% finishing rate) and he entered as the No.21 in the same weight class. Before losing to Belingon in his last bout in 2018 (split and controversial decision), he had beat Martin Nguyen (Bibiano Fernandes vs Martin Nguyen). Belingon vs Fernandes 3 is valid for the ONE Bantamweight title (Belingon’s first defense); undercard of Eduard Folayang vs Shinya Aoki 2 – ONE FC 93. Watch the video and rate this fight! Review by AllTheBestFights.com: 2019-03-31, pretty good finish between Eddie Alvarez and Timofey Nastyukhin but it is not enough to get three stars: it gets two. The former Ufc and Bellator Lw champion Eddie Alvarez entered this fight with a professional record of 29-6-0 (79% finishing rate) and he is ranked as the No.5 lightweight in the world (currently the #1 in this division is Khabib Nurmagomedov) but he comes off the loss against Dustin Poirier (Eddie Alvarez vs Dustin Poirier 2); before this bout, in 2017, he had beat Justin Gaethje (Eddie Alvarez vs Justin Gaethje). His opponent, Timofey Nastyukhin, has a mma record of 12-4-0 (83% finishing rate) and he entered as the No.194 in the same weight class. He fought twice last year beating Amir Khan and losing to Saygid Guseyn Arslanaliev. Alvarez vs Nastyukhin is the quarter-final of the One Fc lightweight world grand prix tournament: undercard of Eduard Folayang vs Shinya Aoki 2 – ONE FC 93. Watch the video and rate this fight! 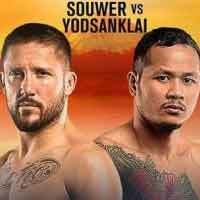 Review by AllTheBestFights.com: 2019-03-31, good pace with a nice finish: Demetrious Johnson vs Yuya Wakamatsu gets three stars. The former Ufc Flw champion Demetrious Johnson entered this fight with a mma record of 27-3-1 (59% finishing rate) and he is ranked as the No.2 flyweight in the world but he comes off the loss against current #1 Henry Cejudo (via split decision, Demetrious Johnson vs Henry Cejudo 2); before this bout, in 2017, he had defeated Wilson Reis (Johnson vs Reis) and Ray Borg (Demetrious Johnson vs Ray Borg). His opponent, Yuya Wakamatsu, has an official record of 10-3-0 (90% ko/tko victory rate – he has never won via submission) but he lost two out of his last three fights, against Senzo Ikeda and Danny Kingad; between these two fights he beat Mamoru Yamaguchi. Johnson vs Wakamatsu is the quarter-final of the One Fc flyweight world grand prix tournament: undercard of Eduard Folayang vs Shinya Aoki 2 – ONE FC 93. Watch the video and rate this fight! Review by AllTheBestFights.com: 2018-11-09, good fight between Bibiano Fernandes and Kevin Belingon 2: it gets three stars. The black belt in Bjj, former Dream and current ONE Bw champion Bibiano Fernandes entered this fight with a pro record of 22-3-0 (45% finishing rate) and he is ranked as the No.19 bantamweight in the world. He suffered his last loss when he faced Hiroyuki Takaya in 2010, since then he has collected 14 consecutive victories beating Reece McLaren (Bibiano Fernandes vs Reece McLaren), Andrew Leone and Martin Nguyen in his last three (Bibiano Fernandes vs Martin Nguyen). His opponent, the black belt in Wushu Kevin Belingon, has an official mma record of 19-5-0 (58% finishing rate) and he entered as the No.24 in the same weight class. He was defeated by Bibiano Fernandes in their first fight in 2016 (Fernandes vs Belingon I) but then he has won six bouts defeating Andrew Leone and Martin Nguyen in his last two as well. Fernandes vs Belingon 2, main event of ONE FC 78, is valid for the ONE bantamweight title – ONE FC 78. Watch the video and rate this fight! Review by AllTheBestFights.com: 2018-11-09, great fight between Giorgio Petrosyan and Sorgraw Petchyindee: it gets three stars. The former Glory, K-1 World Max and current Bellator kickboxing champion Giorgio Petrosyan entered this fight with a pro record of 88-2-2 (38 knockouts) and he is ranked as the No.2 super welterweight in the world. ‘The Doctor’ Petrosyan suffered his second defeat of his career during the semifinal of the Glory lightweight tournament against Andy Ristie in 2013 (Petrosyan vs Andy Ristie), since then he has won twelve bouts beating Crhis Ngimbi (Giorgio Petrosyan vs Chris Ngimbi 2), Jo Nattawut (Giorgio Petrosyan vs Jo Nattawut) and Chingiz Allazov (Giorgio Petrosyan vs Chingiz Allazov). His opponent, the former Lumpinee muay thai champ Sorgraw Petchyindee Academy, has a record of 37-17-0 and he enetered as the No.9 in the same weight class; the Thai fighter comes off the victory over Samy Sana in June. Petrosyan vs Sorgraw is on the undercard of Bibiano Fernandes vs Kevin Belingon 2 – One FC 78. Watch the video and rate this fight! Review by AllTheBestFights.com: 2018-04-20, fight not so exciting between Giorgio Petrosyan and Jo Nattawut: it gets two stars. The former Glory and K-1 World Max champion Giorgio Petrosyan entered this fight with a professional kickboxing record of 86-2-2 (38 knockouts) and he is ranked as the No.4 super welterweight in the world. ‘The Doctor’ Petrosyan suffered his second defeat of his career during the semifinal of the Glory lightweight tournament against Andy Ristie in 2013 (Petrosyan vs Andy Ristie), since then he has won ten bouts beating Artem Pashporin (Petrosyan vs Pashporin), Amansio Paraschiv (Petrosyan vs Paraschiv) and Crhis Ngimbi in 2017 (Giorgio Petrosyan vs Chris Ngimbi 2). His opponent, the former WMC and Lion super welterweight champion Jo Nattawut, has an official record of 60-11-2 and he suffered his last loss in 2016 when he faced Regian Earsel; after this bout he has won four fights beating Kengsiam Nor Sripueng and Petchtanong Banchamek in 2017. Petrosyan vs Nattawut is on the undercard of Kevin Belingon vs Andrew Leone – ONE FC 71. Watch the video and rate this fight!